Put-in: Minto Take-out: Dawson City We wanted to create a trip that embodied all that one envisions when one thinks of the Yukon. 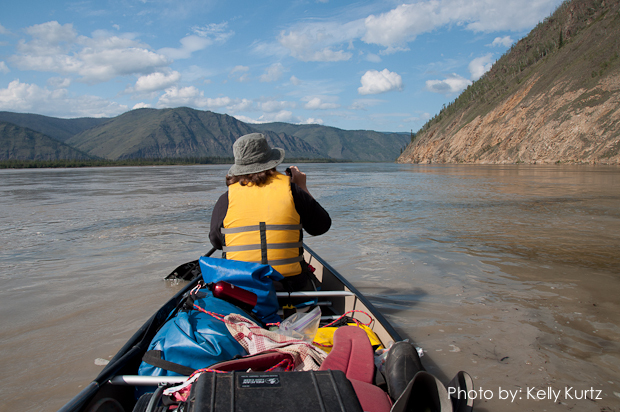 We think that our Yukon River canoe trip from Minto to Dawson City meets that goal. 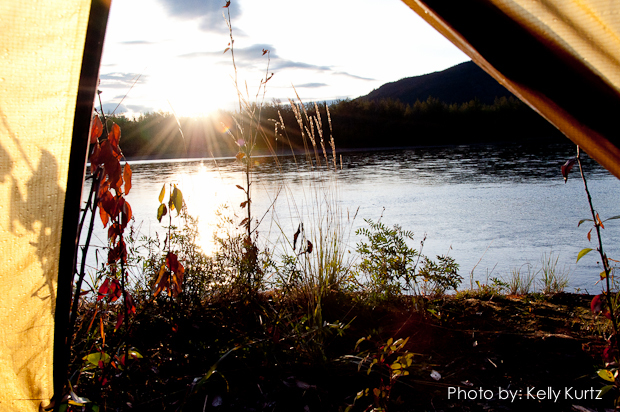 We selected Minto as a starting point because it is here that the Yukon River leaves its parallel course with the RV and tour bus studded Klondike Highway, and enters the remoteness and serenity of Yukon’s wilderness. 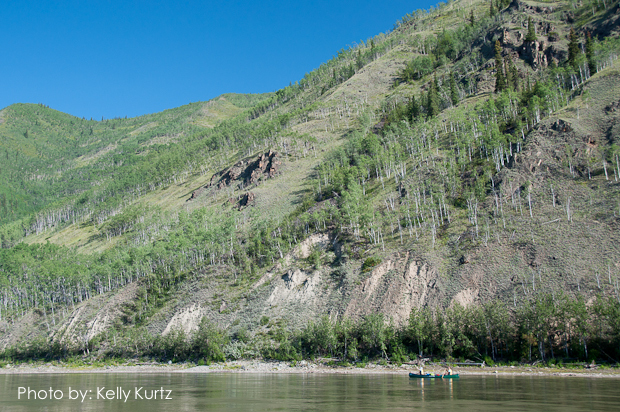 The fast current of the Yukon River will transport us deep into a glaciated landscape of low hills, granite rock, high sandy cliffs, and spruce forest. Along the route chances are very good that we will see an assortment of wildlife from Dahl sheep to bears. 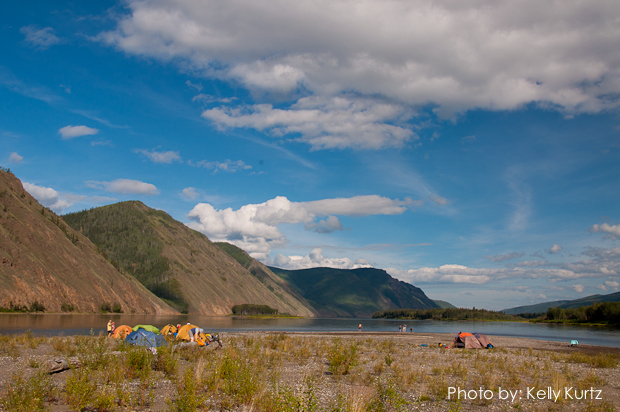 Isolated campsites, many of which are located on islands in the Yukon River, offer a solitude that one must experience to understand. 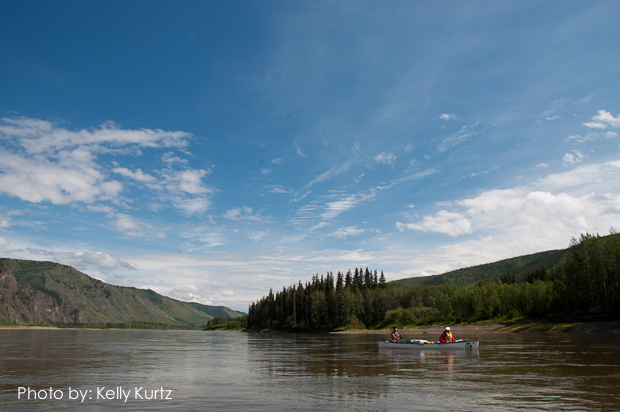 The Yukon is synonymous with the Klondike Goldrush and this portion of the Yukon River highlights this more than any other. We will stop to visit Fort Selkirk, an important settlement from the goldrush through to the 1940s. Buildings still stand to represent a bygone era. We will canoe past Stewart City and Sixty Mile. It is from Sixty Mile, that Robert Henderson, began the search that eventually led to the great goldrush. And what feelings must have accompanied the goldrushers as they rounded the bend in the Yukon River and saw Dawson City for the first time. 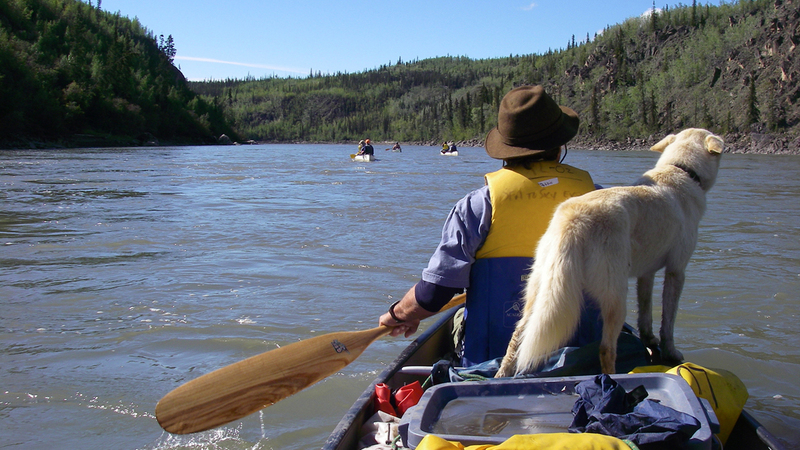 It is an anticipation that many who have done the Yukon River trip with us have expressed. We will spend time in Dawson City, exploring its rich history, visiting the original goldfields, and enjoying the period entertainment. A non-refundable deposit of 30% of the trip fee is required to hold your reservation.The balance of the fee is due 60 days prior to commencement date of the trip. As a significant portion of our trip costs is already committed well in advance of each trip, there is no refund after 60 days. If payment is not received when due, Sea to Sky Expeditions reserves the right to treat the reservation as cancelled. Sea to Sky Expeditions will refund both deposit [less a small administrative fee] and full balance of payment, if we can replace your spot with another participant, less any non-refundable moneys from third party deposits. Cancellation notice must be received in writing. Please note that all tours in B.C and the Yukon. are subject to a 5% GST federal tax. No one may depart on a trip unless all payments and necessary documents (including medical and liability release forms) are received by Sea to Sky Expeditions. Due to the nature of operating in the wilderness and international destinations, prices are subject to change [rare]. Where necessary to change a price, we will try to provide as much notice as possible, and offer you the choice of another trip, or to cancel, with full refund. Our prices are quoted in Canadian dollars. If you choose to pay by credit card, we have to process the payment in Canadian funds. Your credit card company will automatically change it to your currency based on their exchange rate. If you paid your deposit in Canadian funds, please continue to make all further payments in Canadian funds to avoid any confusion in the daily changing exchange rate. Sea to Sky Expeditions reserves the right to alter itineraries or cancel any trip prior to departure for any reason whatsoever, including insufficient booking levels or logistical problems that may impede trip operations. A trip cancellation due to insufficient booking levels will generally occur at least 30 days prior to departure. Sea to Sky Expeditions is not responsible for expenses incurred by trip members in preparing for the trip (i.e. non refundable airline tickets, visa fees, equipment, etc.). A complete itinerary along with maps, clothing and equipment list, will be issued upon registration. Included: Transportation from the point of origin and return, camping fees, cooking gear, camp stoves, tents, meal preparations, canoes, canoe carts, paddles, life jackets, canoe dry bags, two night’s hotel in Dawson City, meals/snacks/beverages on the expedition, tarps, major first aid supplies, emergency radio or satellite phone, and professional guides. 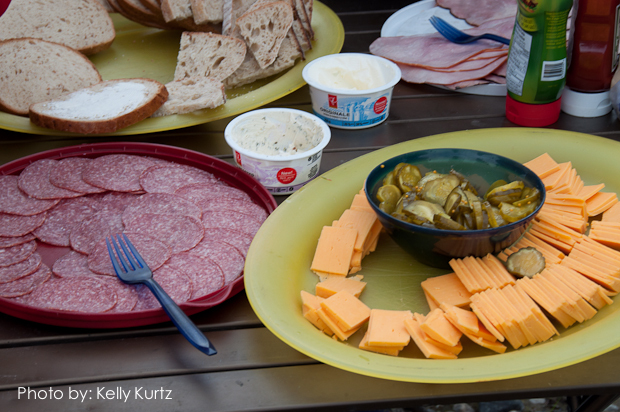 Meals: All meals while on the river. Excluded: Transportation to point of origin, transfers, accommodation and food other than included in the itinerary, and personal equipment. Gratuities are not included. Our guides make every effort to ensure your holiday is all you expected and more. Recognition of a job well done is always appreciated; $10-20/day per guide is recommended. Day 0: Arrival in Whitehorse. This denotes the day or days spent in Whitehorse before the listed start date of the trip. Day 1: After breakfast, we will be picked up by our driver and taken to our destination, Minto, about 3 hours from Whitehorse. Here we will load canoes, review paddling safety and technique, and begin our paddle to historic Dawson. Days 2-8: It is not practical to give a day by day itinerary. We will paddle approximately 50 km/31 mi per day. Our plan is establish camp on the many islands and sandbars which characterize this stretch of river. This will lessen the remote possibility of bear encounters as well as reduce our contact with those pesky mosquitoes. The following, highlight some of the more interesting features of this stretch of river: The sight of Fort Selkirk (125 km from Carmacks) on a high bank remains one of the trip’s highlights. The Hudson’s Bay Company established it in 1848. 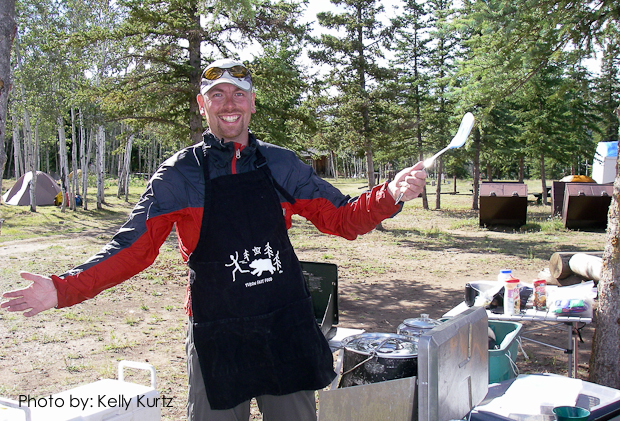 Only accessible by water, Fort Selkirk includes a campsite with well water, tent sites, kitchen shelter with cook stove, bear-proof garbage containers, and a warming cabin. 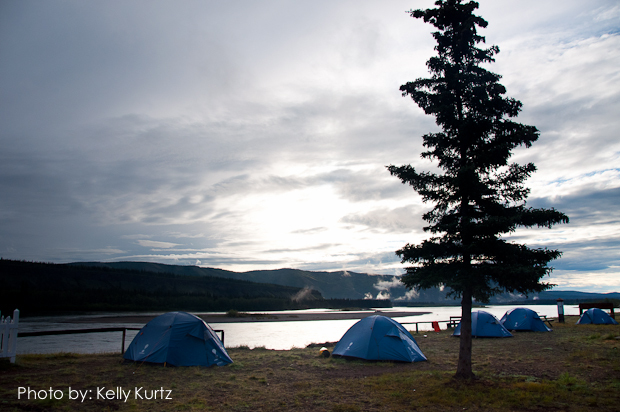 Our trip down the Yukon River normally includes an overnight and layover day at Fort Selkirk. Fort Selkirk has long been a gathering place for First Nation peoples. Stone tools discovered near this site have been dated to 10,000 years old. 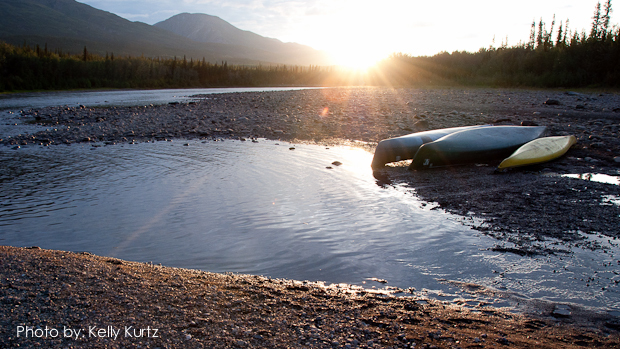 In 1848, John Campbell descended the Pelly River to establish a Hudson Bay Company trading post at the junction of the Yukon and Pelly River. In 1852 the coastal Chilkats, who had previously maintained a monopoly on trade with the local First Nation peoples, reacted to this challenge by looting and then burning the trading post. Campbell fled for his life and it was thirty years before white men returned to the region. In 1889, Arthur Harper re-established a trading post here, calling it Harper’s Landing. In 1894 Bishop Bompass erected a mission house and school. In 1899 the North West Mounted Police built a station here and a post office was opened. With the opening of the Klondike Highway, and the subsequent demise of riverboat traffic, Fort Selkirk was abandoned in the 1950. Today the Canadian Heritage Branch has restored the settlement with the Taylor & Drury store, Mounted Police building, Protestant and Catholic Churches, and schoolhouse among the more than 30 buildings that are open to the public. Once past Fort Selkirk, the surrounding country is at least as impressive as ever. Certainly there is no shortage of historic sites along the banks. 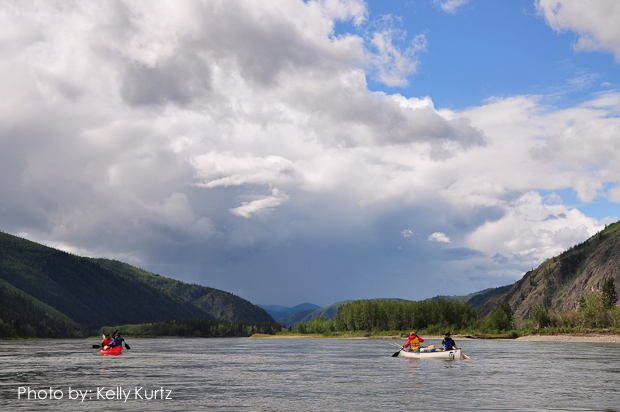 The White River (120 km from Dawson) sees a dramatic difference in the colour (and the sound) of the Yukon River. The colour is the result of a combination of glacial silt, and ash from a volcanic eruption about 1,250 years ago. The ash layer now makes a convenient dating tool for archeologists at sites throughout most of the south and central Yukon. At Stewart City (100 km from Dawson) the river is slowly reclaiming the site. 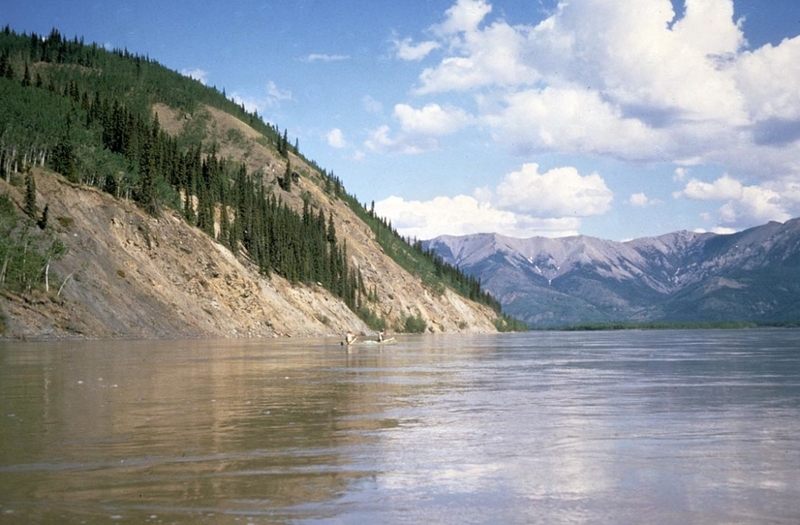 The Stewart River, which joins the Yukon near Stewart City, was one of the earliest of the Yukon’s placer mining areas. Prospectors were probably working on the river by 1880, and in 1885, several fairly rich bars were discovered. Arthur Harper soon set up a post at the mouth of the river to serve these miners. However, when much richer deposits of gold were discovered near Fortymile in 1886, everybody moved there. The Stewart didn’t attract much attention again until the Klondike rush; a fair-sized town was built, with a sternwheeler dock, a NWMP post, a large warehouse, two hotels, a large number of cabins, and an even larger number of tents. The population may have reached 1,000 over the winter of 1898-1899. Although the boom ended, the island maintained a population of between 25 and 50 into the late 1930s. Several buildings have been moved back from the river’s edge in recent years. As we get closer to Dawson, a number of old woodcamps and homesteads have been taken over by new owners and new cabins have been built to replace the old ones. The relatively fertile islands were particularly popular spots for combined wood-cutting/farming operations. Little or nothing remains at most of these sites. Some have been lost to river erosion, or were moved to new locations when the original site was no longer viable. 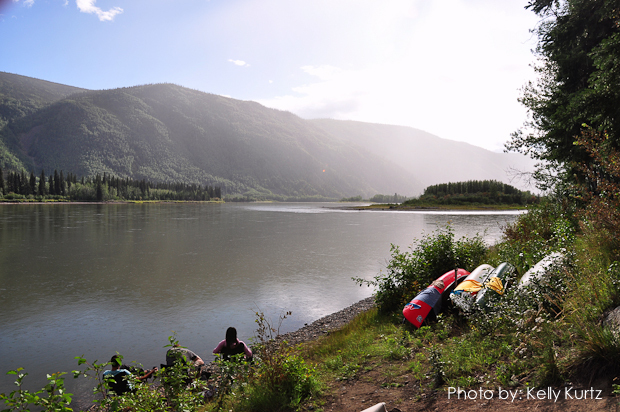 The anticipation heightens with each bend in the river as we near Dawson City. 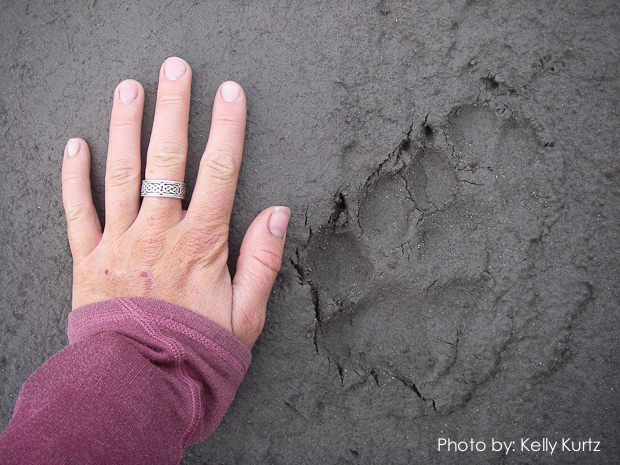 This same thrill and anticipation must have been present with the Klondike goldrushers after their long journey. Finally the Dome, Dawson’s well-known landmark, can be seen in the distance. One more bend and we have arrived. Days 8-10: We have scheduled at least one complete day in Dawson to allow you time on your own to visit the sites that are of most interest to you. We will also drive to visit the original goldfileds and the lookout [Dome]. We will leave Dawson after breakfast on the last day and return to Whitehorse, arriving late afternoon. Along the way we will stop at Braeburn Lodge, a.k.a. Cinnamon Bun Airstrip, for the largest, and best, cinnamon bun around. Whitehorse Air Canada has daily flights to Whitehorse. Air North has scheduled flights from Calgary, Edmonton, and Vancouver to Whitehorse. Please check with your travel agent for details. Air Condor has one direct flight per week from Frankfurt, Germany.